Heather of Relentless Forward Commotion offered to write up the review of the much critisized Run For Your Lives, held this weekend in Candia NH – while many people were locked out due to bad scheduling choices by RFYL, and still haven’t received the refunds promised, it sounds like the event itself was a great time – over to Heather! When I volunteered to review the New Hampshire “Run For Your Lives” for the New England Spahtens, I knew that I would be one of the very few who would be showing up to this race. Apparently, this particular race had multiple venue and date location changes for the New England race, leaving many already registered Sphatens with conflicting schedules. Refunds have been slow to come, and understandably left much of our team with a bad taste in their mouth. I will admit I had low expectations for this race, thanks to the aforementioned knowledge, combined with the fact that as a somewhat competitive obstacle course racer, I thought the idea of running from people dressed as zombies would be pretty lame. So even though I’m bummed for some of you who are still awaiting your refunds, I’m very happy to report that my expectations for this race were absolutely blown out of the water: I had a blast. 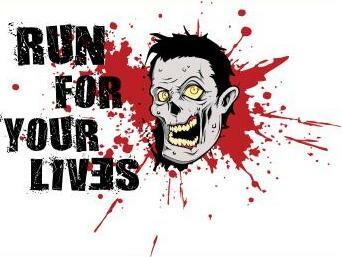 For those of you unfamiliar with Run For Your Lives, the premise is this: you sign up either as a zombie, or a runner (I chose to be a runner, and will be providing a review from that point of view). Runners are given a bib and a Velcro flag belt (as in, flag football). The idea for runners is to make it to the finish line with AT LEAST one of the three flags left, while tackling obstacles and trying to avoid zombies, who are out to steal your flags. Zombies are given a professional make up job (think, Hollywood horror film…some of them were downright terrifying) and placed out on the race course to scare, intimidate, chase , and eat runner’s brains (I mean, take their flags). For the cut and dry details, please keep reading. The race was held at Liquid Planet Water Park, which provided a nice festival feel to racers, family, & friends. On-site “VIP” parking was available for $20. A hefty price tag, but the parking lot was literally steps from the venue. The other option available was to park offsite (for free) and ride a shuttle bus, which was provided by RFYL. In the park itself, there were more than enough port-a-potties (with hand washing stations! ), a large stage playing not only music, but music videos, numerous photo op booths with plenty of zombies wandering around, food and beer options (more on that below), and a merchandise tent. The finish line was incredibly spectator friendly, with plenty of action (and zombies). The emcee was highly entertaining, and spent the day leading group dances (Thriller, anyone?) and games like musical chairs, tug of war, and various ball games. Bag check was free and incredibly well organized. In addition, there was a hosing/shower station at the finish, and both men’s and women’s changing tents. 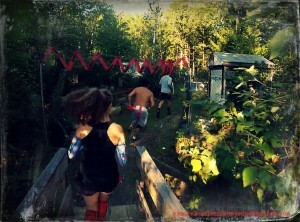 The race was held ON the same venue as a local haunted forest. The creepy vibe was off the charts, as we ran past old decrepit houses, broken down army jeeps, hearses, busted coffins scattered around the forest, and other things that looked like they came straight off of a horror movie set.. It most certainly contributed to the “zombie apocalypse” feel, and gave plenty of hiding places for zombies to jump out of. Elsewhere on the course, we ran up relatively steep inclines (everyone was walking), beautiful single track trails, and even ran by a sparkling river. My only complaint: not enough mud. In fact, the only mud of the day was purposely placed in the tube crawl. This rating certainly needs clarification. If you entered this race expecting a traditional obstacle course race, you would have been disappointed. I personally showed up to this race fully aware that it is a novelty race (such as a color run or glow run), and knew that the few run of the mill obstacles we would encounter were not the highlight of the race. Now, please do not confuse “novelty” with “easy”, as this race was certainly not easy. Constantly sprinting, dodging, and diving from zombies was a killer interval workout and I found my cardiovascular system constantly in the anaerobic zone (in other words: I was sucking wind). Additionally, sprinting, dodging, and diving from zombies was surprisingly fun. But, for those of you who want to know the specifics of the obstacles, we encountered: multiple sets of walls (approximately 4 foot, both “overs” and “throughs”), tube crawls, webbing/entanglement, large hay bales that had to be scaled, a tent full of smoke and live electric wires, nets to crawl under, a tire wall plunging into a pool of “blood” red water, a wire fence crawl at the finish (again, with live wires) and of course, countless zombies. In addition to the race obstacles, as mentioned above, there were many buildings and bridges that were a part of the Haunted Acres that we ran through. Official “Survivors” (meaning, you made it to the finish line with at least one flag, far harder to do than you can imagine) were given a survivor medal. 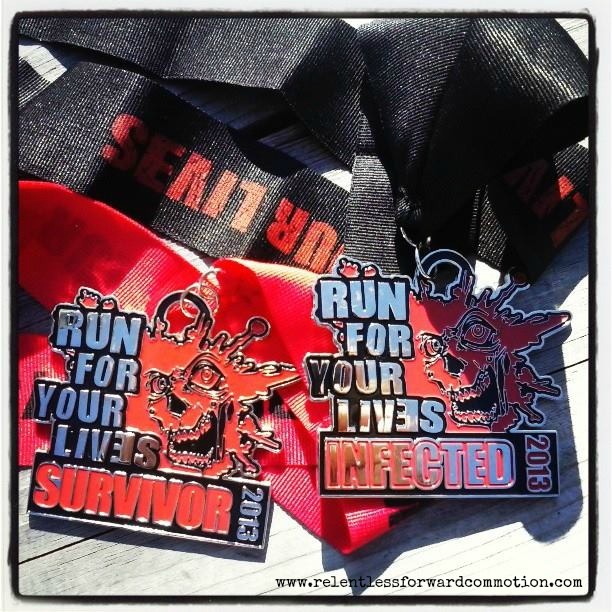 Those who finished without any flags were given an “Infected” medal. All finishers received a tech shirt (unisex). Bonus: flags and belts are yours to keep…if you managed to survive! At the finish line, we were given water and a bag of mixed nuts. I can’t think of a worse option than a bag of mixed nuts, be it peanut allergies, or people like me who simply hate peanuts. I would have LOVED to see an orange slice or banana. The free beer for all racers was Pabst Blue Ribbon. I’m used to free beer typically being the cheaper option, but even if you wanted to purchase a beer, PBR was the ONLY option. I would have loved to have seen a microbrew or any other option really, especially since the post-race party was a big advertised portion of this race. Additional food was available for purchase, but limited to zero options for us vegetarians. 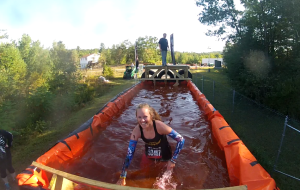 If you are entering this race as a competitive athlete looking to test your most extreme mental and physical limits, then you’ve come to the wrong race. If you are entering this race looking to have a great time, do something out of the norm, and still get in a killer (pun possibly intended) run? Then you should add this race to your “to do” list. This is a great race for weekend warriors, zombie lovers, athletes who want to let loose and have fun, and even those new to exercises looking to enter their first race with a non-competitive atmosphere. While I certainly wouldn’t travel all over the country following this series as many people do with other OCR’s, I would definitely do it again next year. I truly had a really fun time, and am glad to be able to add this unique experience to my race resume. Great review, I was there and agree with you 100%. 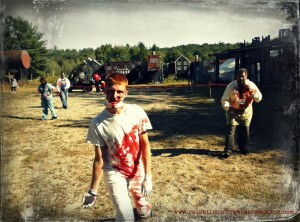 I did last years, there were more zombies, but the trade off of the haunted settings was worth it!